CAIRO: Counting was under way early Sunday after a first-round referendum on a divisive new constitution pushed through by President Mohamed Morsi and his Islamist allies despite weeks of opposition protests. Polling stations in half the country, including the biggest cities of Cairo and Alexandria, were tallying the results from Saturday's voting. Morsi's Muslim Brotherhood and main media outlets said that, based on very early unofficial figures, it appeared that the polling was trending towards 70 percent support for the draft charter. But the opposition disputed that, saying its preliminary figures suggested that 66 percent of the voters had rejected the proposed constitution. It claimed the Muslim Brotherhood had sought to "rig" the vote. If those contradictory positions are maintained, Egypt's turmoil of the past three weeks over the draft constitution will not subside. Violent clashes claimed eight lives on December 5 amid a highly polarised political climate. Late Saturday, riot police fired tear gas to disperse dozens of hardline Islamists who attacked the central Cairo headquarters of the opposition liberal Wafd Party with fireworks and stones, officers at the scene told AFP. On Friday, clashes between stone-throwing and sword-wielding Islamists and opposition supporters erupted in Egypt's second city of Alexandria, injuring 23 people according to the official MENA news agency. To ensure security, 120,000 troops were deployed to reinforce 130,000 police. Voting was being staggered, with half the country casting their ballots on Saturday and the other half a week later. The Muslim Brotherhood has thrown its formidable organisational machine behind a campaign in favour of the draft constitution. The proposed charter "offers rights and stability," said one Cairo voter who backed it, Kassem Abdallah. It will help Egypt "return to normal", agreed another, Ibrahim Mahmoud, a teacher. But many opposition voters were especially hostile toward the Brotherhood, which the Front believes wants to usher in strict Islamic sharia laws. Abbas Abdelaziz, a 57-year-old accountant, said he voted against the charter "because I hate the Muslim Brotherhood. It's very simple. They are liars." Sally Rafid, a 28-year-old Christian, said: "There are many things in the constitution people don't agree on, and it's not just the articles on religion." International watchdogs, the UN human rights chief, the United States and the European Union have expressed reservations about the draft because of loopholes that could be used to weaken human rights, including those of women, and the independence of the judiciary. Analysts said it was likely - but not certain - that the draft constitution would be adopted. Whatever the outcome, "lasting damage to the civility of Egyptian politics will be the main outcome of the current path Morsi has set Egypt on," one analyst, Issandr El Amrani, wrote for his think tank, the European Council on Foreign Relations. "If the 'no' vote wins, the Morsi presidency will have been fully discredited and the pressure for his resignation will only increase," he said. "If 'yes' wins, the protest movement is unlikely to die down, (and) may radicalise." The gunman who massacred 20 children in a Connecticut elementary school riddled them with bullets, shooting some of them as many as 11 times, the medical examiner said today. "I've been at this for a third of a century so my sensibilities may not be the that of the average man, but it's probably the worst I've ever seen," said Chief Medical Examiner H. Wayne Carver II, who has been a medical examiner for 36 years. A team of 14 medical technicians worked through the night to complete the grisly job of identifying the children killed by Adam Lanza, 20, in the Sandy Hook Elementary School massacre so their names could be released today. Several weapons were found in the school, including a semi-automatic rifle. "All the wounds that I know of at this point were caused by the long weapon," Carver said, and many were shot at close range. CLICK HERE for full coverage of the tragedy at the elementary school. "I believe many of them were hit more than once," and he said the wounds were "all over" the children's bodies. "I only did seven of the autopsies. The victims I had ranged from 3 to 11 wounds a piece," Carver said. The names of the children slain Friday in the Newtown, Conn., school were released today. To carry out the identifications, Carver said they "did not bring the families and the bodies into contact." He said the identifications were made through photographs of the children's faces. "It's easier on the families," he said. Additional work is needed to complete the autopsies and identifications of the seven adults slain in Lanza's killing spree. Fresh details of the massacre emerged including the fact that all of the young victims were first graders in two rooms. Based on the Sandy Hook school directory, all the kids killed were in the first grade and were in two classrooms. In one class, 15 of the 16 students listed were killed. In the other class, five of the 16 students died along with their teacher Victoria Soto. Also, nine of the deceased students have siblings in the school. With the tally of Lanza's carnage complete, authorities and the grieving people of Newtown, Conn., are left to wonder why he turned the elementary school in this quaint New England town into a slaughter house. Connecticut State Police Lt. Paul Vance said the investigation "did produce some very good evidence" about motive, but he would not go into further detail. He indicated the evidence came from the shooting scene at the school as well as at the home where Lanza's mother, Nancy, was slain. Also key will be the lone person shot by Lanza who wasn't killed. The female teacher has not been publicly identified. "She is doing fine," Vance said at a news conference today. "She has been treated and she'll be instrumental in this investigation." Vance said it appears that reports of an altercation involving Lanza at the school in the days before the mass slaying are not checking out. Vance said that Lanza forced his way into the school, but did not say how. Evidence emerged today that Lanza's rampage began in the office of school principal Dawn Hochsprung while the school intercom was on. It's not clear whether it was turned on to alert the school or whether it was on for morning announcements, but the principal's screams and the cries of children heard throughout the school gave teachers time to take precautions to protect their children. Hochsprung was among those killed in the Friday morning killing spree. Authorities have fanned out to New Jersey, Connecticut and Massachusetts to interview Lanza's relatives, ABC News has learned. NEW YORK: The US dollar dropped to its lowest level against the euro in three months Friday, the euro going above US$1.31 as politicians in Washington appeared no closer to averting the economy-crunching fiscal cliff. With just over two weeks to go before the deadline, markets began to show strains from worries that US leaders will not be able to carve out a compromise deal to beat the year-end deadline to skirt the cliff's harsh mandatory budget cuts and tax hikes. At 2200 GMT, the euro was at US$1.3161, compared to US$1.3073 late Thursday. The US dollar has slipped steadily for a week amid cliff fears and the Federal Reserve's extension of its bond-buying easy monetary accommodation, aimed at sparking more growth in the sluggish US economy. The yen was mixed ahead of Sunday's Japanese general election: the euro gained to 109.94 yen from 109.38 yen, while the US dollar slipped to 83.52 yen from 83.64. "According to most reports out of Japan, former Prime Minister Shinzo Abe is well ahead in polls and his coalition government should easily take more than 60 per cent of the seats in Parliament, leading to Abe's return to the PM seat," said Neal Gilbert of GFT. "Abe has made many declarations that he wants to become more aggressive with monetary policy by lowering interest rates to 0 per cent, increasing the inflation target to 3 per cent, and increasing the amount of QE (quantitative easing)." Gilbert added that if Abe regains the premiership, the yen's weakness "may be much more long lasting." The US dollar slipped against the Swiss franc to 0.9172 francs, while the British pound edged higher to US$1.6173. WASHINGTON (AP) — The top contenders for the "big three" jobs in President Barack Obama's second-term Cabinet are all white men, rekindling concerns among Democratic women about diversity in his inner circle. Now that Susan Rice has withdrawn under pressure from consideration as the next secretary of state, Democratic Sen. John Kerry of Massachusetts is the front-runner for the nation's top diplomatic post. Former Republican Sen. Chuck Hagel of Nebraska is Obama's favored candidate to run the Pentagon, and White House chief of staff Jack Lew is likely to be his next treasury secretary if he wants the job. "The boys network is alive and well," Democratic activist Donna Brazile wrote on Twitter after Rice withdrew. "The war on qualified women continues here in DC." Rice, the U.S. ambassador to the United Nations and a close friend of the president, dropped out of consideration for the State Department job Thursday. That followed months of withering criticism from Republicans over her initial comments about the attacks on Americans in Benghazi, Libya — criticism several female House Democrats said smacked of sexism and racism. Rice is black. Her withdrawal reignited questions about gender diversity in the upper echelons of the administration, a concern that has nagged at the Obama White House for years. The questions grew so persistent early in Obama's first term that the president invited his upper-level female staffers to a dinner to get their input on how to shake his administration's "boys club" reputation. Now, senior administration officials are considering whether a prominent woman should be named to a top Cabinet post in order to create gender balance, according to a person familiar with White House thinking. That person spoke only on condition of anonymity because the person was not authorized to publicly discuss internal White House deliberations. Among those whose names have been mentioned within the administration, former Defense Department official Michele Flournoy is being considered to lead the Pentagon and Lael Brainard, Treasury's undersecretary of international affairs, has been cited as a contender for her agency's top job. Former California Rep. Jane Harman has been discussed as a candidate for director of the Central Intelligence Agency. A woman has never held the top job at any of those agencies. White House press secretary Jay Carney said Friday, "The president's approach has always been to seek excellence and as part of that believes diversity in terms of highly qualified candidates enhances excellence." Grumblings about gender diversity in the Obama administration have never focused on raw numbers but more on whether enough women were in high-powered decision-making roles. "While numbers say a lot, they don't say everything," said Marcia Greenberger, co-president of the National Women's Law Center. "Role and influence are important factors to bring to bear." Secretary of State Hillary Rodham Clinton certainly has had a high-powered role in the administration, as did Health and Human Services Secretary Kathleen Sebelius during the debate on health care reform. Longtime Obama confidante Valerie Jarrett serves as a White House senior adviser and has the strongest personal relationship with the president of anyone in the administration. And women backed Obama over Republican Mitt Romney in the November election, 55 percent to 43 percent. Yet a photograph released by the White House Friday showing Obama meeting with his senior advisers underscored where critics see problems. Jarrett is the only woman among the six aides in the room. Obama appointed seven women to his 22-person Cabinet during his first term. An eighth woman, Rebecca Blank, is currently serving as interim Commerce Secretary after John Bryson resigned earlier this year. Some women in the Cabinet are expected to stay on for at least some of the second term, including Sebelius and Homeland Security Secretary Janet Napolitano. Rice also will remain in the Cabinet as long as she stays in her post as the United Nations. 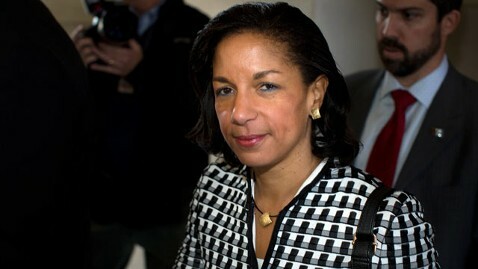 The controversy surrounding Rice centered on her assertion in Sunday talk shows that the attack in Libya was a spontaneous demonstration over an anti-Muslim video produced in the U.S. Rice later acknowledged that was wrong, but she also said she was relying on an account that was provided by intelligence officials, who have since said their understanding of the attack evolved as more information came to light. Republican lawmakers, led by Sens. John McCain of Arizona and Lindsey Graham of South Carolina, aggressively criticized Rice for her statements on Benghazi, calling her unqualified and untrustworthy. MCain said she was "not being very bright" in her comments. That comment in particular provoked the ire of a dozen House Democratic women, who leapt to Rice's defense and accused McCain and Graham of being motivated by sexism and racism. Rice never publicly agreed with their assessment. In the aftermath of her withdrawal, other Democratic women lamented that they hadn't done more to assist Rice as the criticism mounted. "The thing about Susan Rice that really bothers me, the women's groups, the civil rights groups, we should have stood up more," said Celinda Lake, a Democratic pollster, on MSNBC. While Obama and others in the administration vigorously defended Rice, the White House never appointed a team to coordinate the administration's response to the criticism, in large part because Rice was not an official nominee. Three patients have been taken to Danbury Hospital, which is also on lockdown, according to the hospital's Facebook page. BRUSSELS: EU leaders debated the euro's future in a bullish mood Thursday after deals on banks and Greece, despite fears that political uncertainty in Italy could cause new worries for the single currency. As video showed the bloc's 27 leaders smiling and joking with each other at the beginning of a two-day summit, EU President Herman Van Rompuy said leaders should aim to cap a triumphant week that began with the European Union picking up the Nobel Peace Prize. "We started the week well in Oslo. Let's finish it well here in Brussels with a further positive outcome," Van Rompuy said. "The worst is now behind us, but of course much still needs to be done," he added as the leaders began deliberations on how to make the 17-nation eurozone more stable after a crippling three-year crisis. The hero of the day was Italy's Prime Minister Mario Monti, hailed for tough reforms that have brought Italy back from the brink of financial collapse but who announced last weekend he would be stepping down. "Confidence has been returning in Italy's capacity to solve problems," said European Commission chief Jose Manuel Barroso. "Let me praise Mario Monti and his government for this." Jitters over Italy's political situation loomed over the summit, after Monti said he would soon step down and former leader Silvio Berlusconi indicated he might run for a fourth term. But on the sidelines of the talks, Berlusconi hinted he might not put himself forward, telling Belgian television channel VRT that he had "so much to do" outside politics. At the talks, leaders will debate a report drawn up by Van Rompuy that proposes steps towards greater economic integration in the eurozone, eventually with a common "fiscal capacity" and binding reform commitments. Following on the heels of a summit only last month that collapsed over the EU's seven-year budget, the atmosphere was noticeably brighter after ministers sealed much-heralded agreements on supervising big banks and aid to Greece. Greek Prime Minister Antonis Samaras exclaimed that "Grexit is dead", meaning the prospect of Greece leaving the euro currency area was no longer possible after ministers released bailout funds to avert bankruptcy. After a buy-back programme designed to reduce Greece's debt mountain, Eurogroup head Jean-Claude Juncker said a first payment of 34.3 billion euros ($44.7 billion) would be flowing to Athens "as early as next week." This instalment would go to help recapitalise Greece's crisis-wracked banks, to be followed by another 14.8 billion euros in the first quarter of next year. An ecstatic Samaras, who has pushed through painful reforms demanded by creditors often in the face of violent protest, told reporters: "Greece is back on its feet. The sacrifices of the Greek people have not been in vain." "Today is not only a new day for Greece, it is indeed a new day for Europe," he added. "It is flying. It is happening"
Hours before the Greece deal, ministers charged the European Central Bank with monitoring banks with assets of more than 30 billion euros, or equal to 20 percent of a state's economic output from March 2014. The agreement, which German Chancellor Angela Merkel said "cannot be valued highly enough", is the first step on the path towards a banking union and clears the way for EU bailout funds to recapitalise struggling banks directly. Merkel called the move a "big step towards more reliability and trust in the eurozone." The new Single Supervisory Mechanism (SSM) for the eurozone -- which Britain and Sweden will not take part in -- will mean the ECB directly supervising some 200 of the biggest banks out of the estimated 6,000 eurozone lenders. ECB chief Mario Draghi hailed the accord as "an important step towards a stable economic and monetary union, and towards further European integration". More excitedly, Barroso said: "You remember, when we spoke about this some time ago, people said it will not fly. It is flying. It is happening." Merkel voiced some satisfaction as she looked back on a year of seemingly endless crisis summits, damaging market volatility and, at times, near break-up of the eurozone bloc. "All in all, I want to state at the end of 2012 that we have achieved a lot. It was a very heavy year in terms of work but it was also a year in which we managed to make big progress," said the leader of Europe's biggest economy. The head of the European Parliament, Martin Schulz, however complained that workers' rights had not been taken sufficiently into account. "As the representatives of the people, we are annoyed that the social pact that we asked for has not been included in the report drawn up by Mr Van Rompuy," Schulz told reporters. WASHINGTON (AP) — Nineteen states have turned down the Obama administration's invitation to run the new health insurance markets that will begin serving millions of uninsured Americans less than a year from now. That puts a huge task on the feds, a defining challenge for President Barack Obama's second term. Friday is decision day for states to notify Washington if they will set up their own insurance exchanges under the federal health care law. Monitoring by The Associated Press finds a divided nation moving ahead, despite the misgivings of some state officials. Half the states now say they will participate in some way. Still, drafters of the law did not anticipate that so many states would remain on the sidelines at this late stage. Federal control of the new state markets where individuals, families and small businesses will shop for taxpayer-subsidized private coverage was seen as a failsafe, not the standard for nearly half the country. Critics predict delays. All of the states refusing are led by Republicans. On the other side of the ledger, 17 states and Washington, D.C., say they want to set up and run their own markets. The administration has already started granting approvals. Eight other states have indicated they want to pursue a partnership with Washington, and more may do so. Only six remain undecided. Exchanges are the gateway to the new health care law for individuals and families who buy their own health insurance, as well as for small businesses. Currently, it's hard to tell what's a good plan or a fair price. You can get turned down if you have a medical problem, charged more if you are older or a woman. The health care law forbids insurers from turning away the sick, limits what they can charge older people and bans gender-based surcharges. It also requires virtually all Americans to get coverage or face fines. Exchanges are supposed to make picking health insurance like buying an airline ticket from an online travel site like Orbitz or Expedia. There will be a website, and you'll be able to put in your ZIP code and get a list of available health plans. There will be a section where you can find out if you qualify for subsidies, or for Medicaid. There will be cost calculators to allow you to compare different levels of coverage: platinum, gold, silver and bronze. There will be tools that allow you to see if your doctor or hospital is with a particular plan. Middle-class consumers will be able to find out if they are eligible for government help with their premiums for private insurance. Initially, nearly 9 of every 10 taking part will get assistance. Low-income people can use the exchanges to find out whether they are eligible for expanded Medicaid coverage under the law. In addition to deciding how to implement exchanges, states must also decide whether to accept the Medicaid expansion. There's no deadline set for that decision, and most are still weighing options. Open enrollment for exchange plans starts next Oct. 1, and coverage begins Jan. 1, 2014. Initially around 10 million people are expected to sign up, growing rapidly thereafter. California, New York and Kentucky are among the states that have opted to create their own exchanges. Among those passing are Texas, Georgia and Kansas. Partnership states include Illinois and West Virginia. Republican governors rejecting state exchanges have cited a variety of reasons. Some say the administration has not provided enough information. Others say there's too much federal regulation. Most have concerns about costs. But some Republican leaders have broken ranks, including governors in Idaho, Nevada and New Mexico, and the insurance commissioner in Mississippi. In announcing his support for a state exchange this week, Idaho Gov. C.L. "Butch" Otter said, "it would be irresponsible of me to simply abandon the field to federal bureaucrats. In the face of uncertainty we must assert our independence and our commitment to self-determination, while fulfilling our responsibility to the rule of law." Indeed, exchanges have a Republican pedigree. The idea was pioneered in Massachusetts under then-Gov. Mitt Romney's health care overhaul. "All this is full of irony," said consultant Jon Kingsdale, who founded the Massachusetts exchange for Romney. "If you had asked many of those (Republican) governors four years ago before this got politicized, it would have been a no-brainer: 'We want the states to do it.'" The health care law increased the power of the federal government, but states that run their own exchanges retain important roles overseeing insurance plans, addressing consumer issues and coordinating between the new marketplace and their Medicaid plans. That last item may be the most important, since Medicaid is a major component of state budgets. Critics of the law believe the Obama administration will be overwhelmed trying to set up so many exchanges in states that are hostile to the idea. Some say the president may have to accept delays, perhaps in the face-saving context of budget negotiations where a delay would count as savings. Publicly, administration officials are adamant that won't happen, and independent observers are starting to believe them. "It would be politically unwise for the president to delay the start of these benefits," said Dan Mendelson, president of Avalere Health, a market analysis firm. "If this is going to be a legacy item, he's got to move forward." The key to that will be something called the federal exchange, the fallback, which is on a tight development schedule overseen by Health and Human Services Secretary Kathleen Sebelius. The government has awarded two big technology contracts for exchanges. Virginia-based CGI Federal Inc. is building the federal exchange. Maryland-based Quality Software Services Inc. is building what's called the federal data services hub, an electronic back office that will be used by the federal exchange and state exchanges to verify identity, income, citizenship and legal residence. Estimated price tag for the federal exchange: at least $860 million. "We are all keenly aware that open enrollment is coming quickly," said Gary Cohen, who heads the HHS office overseeing the rollout. "And we will be ready to open our doors." Associated Press writer John Miller in Boise, Idaho, contributed to this report. If the world's entire population went in for a collective checkup, would the doctor's prognosis be good or bad? Both, according to new studies published in The Lancet medical journal. The vast collaborative effort, called the Global Burden of Diseases, Injuries, and Risk Factors Study 2010, includes papers by nearly 500 authors in 50 countries. Spanning four decades of data, it represents the most comprehensive analysis ever undertaken of health problems around the world. It reveals that, globally, we're living longer but coping with more illness as adults. In 1990, "childhood underweight"—a condition associated with malnutrition, measles, malaria, and other infectious diseases—was the world's biggest health problem. Now the top causes of global disease are adult ailments: high blood pressure (associated with 9.4 million deaths in 2010), tobacco smoking (6.2 million), and alcohol use (4.9 million). We're living longer. Average life expectancy has risen globally since 1970 and has increased in all but eight of the world's countries within the past decade. Both men and women are gaining years. From 1970 to 2010, the average lifespan rose from 56.4 years to 67.5 years for men, and from 61.2 years to 73.3 years for women. Efforts to combat childhood diseases and malnutrition have been very successful. Deaths in children under five years old declined almost 60 percent in the past four decades. Developing countries have made huge strides in public health. In the Maldives, Bangladesh, Bhutan, Iran, and Peru, life expectancy has increased by more than 20 years since 1970. Within the past two decades, gains of 12 to 15 years have occurred in Angola, Ethiopia, Niger, and Rwanda, an indication of successful strategies for curbing HIV, malaria, and nutritional deficiencies. We're beating many communicable diseases. Thanks to improvements in sanitation and vaccination, the death rate for diarrheal diseases, lower respiratory infections, meningitis, and other common infectious diseases has dropped by 42 percent since 1990. Non-infectious diseases are on the rise, accounting for two of every three deaths globally in 2010. Heart disease and stroke are the primary culprits. Young adults aren't doing as well as others. Deaths in the 15 to 49 age bracket have increased globally in the past 20 years. The reasons vary by region, but diabetes, smoking, alcohol, HIV/AIDS, and malaria all play a role. The HIV/AIDS epidemic is taking a toll in sub-Saharan Africa. Life expectancy has declined overall by one to seven years in Zimbabwe and Lesotho, and young adult deaths have surged by more than 500 percent since 1970 in South Africa, Botswana, Zambia, and Zimbabwe. We drink too much. Alcohol overconsumption is a growing problem in the developed world, especially in Eastern Europe, where it accounts for almost a quarter of the total disease burden. Worldwide, it has become the top risk factor for people ages 15 to 49. We eat too much, and not the right things. Deaths attributable to obesity are on the rise, with 3.4 million in 2010 compared to 2 million in 1990. Similarly, deaths attributable to dietary risk factors and physical inactivity have increased by 50 percent (4 million) in the past 20 years. Overall, we're consuming too much sodium, trans fat, processed meat, and sugar-sweetened beverages, and not enough fruits, vegetables, whole grains, nuts, fiber, calcium, and omega-3 fatty acids. Smoking is a lingering problem. Tobacco smoking, including second-hand smoke, is still the top risk factor for disease in North America and Western Europe, just as it was in 1990. Globally, it's risen in rank from the third to second leading cause of disease. To find out more and see related charts and graphics, see the Institute for Health Metrics and Evaluation, which led the collaboration. “That trade-off is simply not worth it to our country,” she added. Rice has been criticized by Republicans for her response to questions on the Sunday talk shows shortly after the terrorist attack on the U.S. consulate in Benghazi killed four Americans. Sources tell ABC News that even before Rice withdrew her name from consideration to be Secretary of State earlier today, Senator John Kerry, D-Mass., had emerged as the leading contender, with the president convinced he would be the better Secretary of State. The president is all but certain to nominate Kerry, sources say, though no official decision has been made. The position of Secretary of Defense is not as far along in the process, but sources say former Sen. Chuck Hagel, R-Neb., seems to have an edge right now over other possible candidates such as former undersecretary of defense for policy Michelle Flournoy and deputy Secretary of Defense Ashton Carter. The CIA director slot, sources say, will go to either acting director Michael Morrell or White House counterterrorism adviser John Brennan. President Obama, who publicly defended Rice on several occasions, has accepted her decision to remove her name from the running. “I have every confidence that Susan has limitless capability to serve our country now and in the years to come, and know that I will continue to rely on her as an advisor and friend,” Obama said in a written statement. Two Republican members of Congress who had adamantly opposed Rice’s potential nomination both reacted quickly. JUST say yes to considering relaxed drug controls, urged a panel of UK parliamentarians this week - but Prime Minister David Cameron has rejected the calls. Many countries have loosened their penalties for drug use, including the Czech Republic and Portugal, which introduced a "de-penalisation" strategy in 2000. Citizens caught in possession avoid criminal records but must attend drug advice sessions. Last month, the US states of Colorado and Washington voted to legalise the recreational use of cannabis. The UK report calls for the effects of these legal moves to be monitored. "Drugs policy ought to be evidence-based as much as possible," it concludes. "We recommend that the government fund a detailed research project to monitor the effects of each legalisation system." The report notes that 21 countries have now introduced some form of decriminalisation. But the government's response has been lukewarm. "I don't support decriminalisation," said Cameron. "We have a policy which actually is working in Britain. Drugs use is coming down." SINGAPORE: While the by-election in Hougang earlier this year was called under identical circumstances - where an incumbent Member of Parliament (MP) vacated his seat because of an extramarital affair - political analysts TODAY spoke to were split over whether it could be used to gauge if and when a by-election will be held in Punggol East, following the resignation of its MP, Mr Michael Palmer. The Hougang by-election was called about three months after former MP Yaw Shin Leong was expelled from the Workers' Party for "indiscretions in personal life", after rumours had emerged about an affair with a fellow party member. Institute of Policy Studies Senior Research Fellow Gillian Koh said any by-election could follow a timeline and process that is similar to the recent Hougang by-election. Dr Koh said: "The public and residents in the SMC (Single Member Constituency) may expect the same kind of resolution as the Hougang case even if (the constituency) is supported by the massive PAP machinery and voted the PAP in the majority in the General Election last year." Former Nominated MP Zulkifli Baharudin felt that a by-election would be called in less than three months. "(The PAP) would make a quick decision. Looking at the way they have been handling this whole matter, I think they would get on with it as fast as possible, as there is no point in dragging this," he said. But Assistant Professor Eugene Tan, a law lecturer at the Singapore Management University, disagreed. It could be much longer - in about six to 12 months - before one might be held, given the packed political calendar in the months ahead, he said. Asst Prof Tan, who is also a Nominated Member of Parliament, noted that for example, Parliament is set to discuss a White Paper on population and Budget 2013 in the first few months of next year. He added: "Generally, the longer the time interval is between the vacating of the seat, and the by-election, the better it is (for the party)." In fact, there is no certainty that a by-election will be called in Punggol East, Asst Prof Tan pointed out. There is the question of "whether the People's Action Party wants to create a political norm, to call for a by-election whenever a seat is being vacated", he added. Should a by-election be called in Punggol East, it will be the fourth election held in the country in a short span of time - after the General Election and Presidential Election last year, and the Hougang by-election earlier this year. WASHINGTON (AP) — The Obama administration is drawing no "red line" for North Korea after a successful long-range rocket test, tempering the public condemnation to avoid raising tensions or possibly rewarding the reclusive communist nation with too much time in the global spotlight. The U.S. has told the world that it won't tolerate Iran's acquisition of nuclear weapons or Syria's use of chemical stockpiles on rebels. North Korea, in some ways, is a trickier case. The U.S. wants to forcefully condemn what it believes is a "highly provocative act," and that was the first public reaction from the White House late Tuesday. But it also is mindful of the turmoil on the Korean peninsula and treading carefully, offering no threat of military action or unspecified "consequences" associated with other hot spots. Just two years ago, the North allegedly torpedoed a South Korean warship and shelled a South Korean island. Some 50 South Koreans died in the attacks that brought the peninsula to the brink of war. North Korea already has the deterrent of a nuclear weapons arsenal. The U.S. is bound to protect next-door South Korea from any attack, but has no desire now for a military conflict. Raising the rhetoric can even serve as a reward for seeking attention to a government that starves its own citizens while seeking to leverage any military advance it makes into much-needed aid. "No doubt Pyongyang is pleased. It again has unsettled its leading adversaries. And it is in the news around the world," said Doug Bandow, senior fellow at the Cato Institute. "The allies should have responded with a collective yawn. After all, the plan is nothing new. The DPRK has been testing rockets and missiles for years." The United States remains technically at war with the notoriously unpredictable North Koreans, whose opaque leadership has confounded successive American administrations. With no peace agreement, only the 1953 armistice ending the Korean War keeps the U.S. and the North from hostilities. Some 28,500 U.S. troops remain in South Korea to deter potential aggression. Wednesday's surprising, successful launch raises the stakes, taking North Korea one step closer to being capable of lobbing nuclear bombs over the Pacific. As the North refines its technology, its next step may be conducting another nuclear test, experts warn. The three-stage rocket is similar in design to a model capable of carrying a nuclear-tipped warhead as far as California. Despite its technological advances and military bluster, it's doubtful that the North intends to strike first against the U.S. Even so, Defense Secretary Leon Panetta said the U.S. has the capability to prevent such a strike. "I'm very confident that American defense capabilities are able, no problem, to block a rocket like this one," Panetta told CNN in an interview Wednesday when asked about the capability of U.S. missile defense systems. North Korea has spent decades threatening but avoiding a direct confrontation with the tens of thousands of American forces in South Korea and Japan. The government has remained firmly in power despite a drought-plagued agricultural sector that leaves many North Koreans in search of food and a crumbling economy that affords few any chance of social betterment. "It is regrettable that the leadership in Pyongyang chose to take this course in flagrant violation of its international obligations," White House press secretary Jay Carney told reporters. He said the U.S. would try to further isolate North Korea in response. State Department spokeswoman Victoria Nuland called the launch "highly provocative and a threat to regional security." It will only further impoverish North Koreans, she said. Neither Carney nor Nuland elaborated on possible consequences. The White House's initial statement referred only to potential action at the U.N. Security Council, which condemned North Korea on Wednesday and said it would urgently consider "an appropriate response." The threat of sanctions is unclear; China, North Korea's benefactor, holds veto power. Analysts were mixed on whether a tougher reaction was appropriate. "There has been an unspoken tendency in the United States to discount these tests as yet another foolish attempt by the technologically backward and bizarre country," said Victor Cha, a Korea expert at Georgetown University and former White House policy director for Asia. "This is no longer acceptable. The apparent success of this test makes North Korea one of the only nonallied countries outside of China and the Soviet Union to develop long-range missile technology that could potentially reach the United States." The administration's restrained response contrasts with the warnings of military action against Iran and Syria for actions far less imminently threatening to the United States, but directly threatening Israel, an important ally. Obama has said he won't allow Iran to acquire nuclear weapons and insists that he won't get involved in a policy of containment similar to the one the U.S. is stuck with in North Korea. He promises that he isn't bluffing. The U.S. and Israel have held talks over what benchmarks in uranium enrichment and weapons work the Iranians would have to reach for possible military action to be triggered. What's clear from his words is that Obama wouldn't wait for Iran to have a bomb, meaning the threshold for a U.S. attack against Tehran is far lower than against North Korea, which tested its first nuclear weapon more than six years ago. As for Syria, the president has issued a "red line" to President Bashar Assad's government concerning chemical weapons that have never been used and are accompanied by no weapon capable of delivering them anywhere near the United States. U.S. officials fear the increasingly desperate Assad could deploy the weapons in a bid to win a civil war that has left more than 40,000 people dead since March 2011. Or, he could transfer some weapons to anti-U.S. and anti-Israeli militant groups such as Hezbollah. Judged on capacity and not intent, either of those scenarios would pale in comparison to the North being able to fire a nuclear warhead at the continental United States. But with U.S. officials convinced that Assad's exit may be nearing, the sterner American cautions in Syria may be less likely to be tested. If they are, the United States wouldn't have to worry about nuclear weapons as a counter-threat. Associated Press writers Matthew Lee in Washington and Edith M. Lederer at the United Nations contributed to this report. When Stewart started to investigate insect excretory systems, he made a "fascinating" discovery that certain organs in the termite's excretory system contain varying amounts of metals-hinting at unknown processes going on inside the termite. That's important, he said, because it means that termite waste is a "driving force" for how metals get redistributed in an ecosystem. In the days before he stole a semiautomatic weapon and stormed into an Oregon shopping mall, killing two people in a shooting spree, Jacob Roberts quit his job, sold his belongings and began to seem "numb" to those closest to him. Roberts' ex-girlfriend, Hannah Patricia Sansburn, 20, told ABC News today that the man who donned a hockey mask and opened fire on Christmas shoppers was typically happy and liked to joke around, but abruptly changed in the week before the shooting. Roberts unleashed a murderous volley of gunfire on the second floor of the Clackamas Town Center on Tuesday while wearing the mask and black clothing, and carrying an AR-15 semiautomatic weapon and "several" magazines full of ammunition. He ended his barrage by walking down to the first floor of the mall and committing suicide. "I don't understand," Sansburn said. "I was just with him. I just talked to him. I didn't believe it was him at all. Not one part of me believed it." She said that in recent weeks, Roberts quit his job at a gyro shop in downtown Portland and sold all of his belongings, telling her that he was moving to Hawaii. He had even purchased a ticket. She now wonders if he was really planning to move. "He was supposed to catch a flight Saturday and I texted him, and asked how his flight went, and he told me, 'oh, I got drunk and didn't make the flight,'" she said. "And then this happens... It makes me think, was he even planning on going to Hawaii? He quit his job, sold all of his things." Roberts described himself on his Facebook page as an "adrenaline junkie," and said he is the kind of person who thinks, "I'm going to do what I want." Roberts, who attended Clackamas Community college, posted a picture of himself on his Facebook page firing a gun at a target. His Facebook photo showed graffiti in which the words "Follow Your Dreams" were painted over with the word "Cancelled." Sansburn said the pair had dated for nearly a year but had broke up over the summer. Throughout their relationship, she had never seen him act violently or get angry. "Jake was never the violent type. He didn't go out of his way to try to hurt people or upset people. His main goal was to make you laugh, smile, make you feel comfortable. I never would have guessed him to do anything like this ever," she said. "You can't reconcile the differences. I hate him for what he did, but I can't hate the person I knew because it was nothing like the person who would go into a mall and go on a rampage. I would never associate the two at all." The last time she saw him, which was last week, he "seemed numb," and she didn't understand why, she said. "I just talked to him, stayed the night with him, and he just seemed numb if anything. He's usually very bubbly and happy, and I asked him why, what had changed, and said 'nothing.' He just had so much he had to do before he went to Hawaii that he was trying to distance himself from Portland," Sansburn said. Sansburn said the last message she sent Roberts was a text, asking him to stay, and saying she didn't want him to leave. He replied "I'm sorry," with a sad face emoticon. Police are still seeking information about what Roberts was doing in the days leading up to the shooting. They said today they believe Roberts stole the gun he used in the rampage from someone he knew. They have searched his home and his car for other clues into his motive. Clackamas County Sheriff Craig Roberts said earlier today on "Good Morning America" that he believes Roberts went into the mall with the goal of killing as many people as he could. "I believe, at least from the information that's been provided to me at this point in time, it really was a killing of total strangers. To my knowledge at this point in time he was really trying, I think, to kill as many people as possible." Sansburn said she has not talked to police. WASHINGTON: President Barack Obama said Tuesday that the Syrian opposition was now "the legitimate representative" of the Syrian people, in the most significant US intervention yet in the brutal civil war. "We have made a decision that the Syrian opposition coalition is now inclusive enough, is reflective and representative enough of the Syrian population, that we consider them the legitimate representative of the Syrian people," Obama told ABC News in an interview. France last month became the first Western nation to formally recognise the Syrian National Coalition group as the sole legitimate representative of the Syrian people, as it fights beleaguered President Bashar al-Assad. Britain, Turkey and the Gulf Cooperation Council followed suit, but the coalition did not win immediate universal backing because of doubts about whether it is genuinely representative of all sectors of Syrian society. Earlier, Washington blacklisted an Al-Qaeda-linked rebel group in Syria, warning extremists could play no role in building the nation's future as the US readied to recognise the new Syrian alliance. "There is a small element of those that oppose the Assad regime, that in fact are affiliated with Al-Qaeda in Iraq and we have designated them, Al-Nusra, as a terrorist organization," Obama said in the interview. Though a minority, Al-Nusra has been one of the most effective rebel groups fighting to overthrow President Bashar al-Assad, raising concerns that hardline extremists are hijacking the 21-month-old revolt. Senior officials however said that despite the move on recognising the opposition, Washington sticks by its policy of not directly arming the rebels. We now know what's on the other side of that menacing year-end "fiscal cliff." Another cliff. While White House and Republican congressional leaders labor behind closed doors to cut a deal to steer clear of the first cliff — mandatory tax increases and spending cuts due to hit in early January — another treacherous economic precipice looms. It's when the government will again bump up against the congressionally-set debt ceiling. The debt limit has been a growing source of acrimony between presidents and opposition parties. As a senator, Barack Obama voted against a 2006 debt-limit request by President George W. Bush, calling it "a sign of leadership failure." Bush won that one. The last debt-limit standoff came in August 2011 and the drawn-out gamesmanship cost the U.S. a first-ever credit downgrade. The current statutory limit on the government's borrowing authority of $16.4 trillion will technically be reached in late December, but likely can be put off until mid-February through accounting maneuvers. Obama has asked Congress for authority to raise the debt limit without prior approval. But Republicans seem unlikely to give up that bargaining chip. "Republicans know that they have the debt ceiling that's coming up right around the corner and the leverage is going to shift as soon as we get beyond this (fiscal cliff) issue," says Sen. Bob Corker of Tennessee. And he's a Republican who's sympathetic to Obama's plan to raise taxes on the wealthy. President Ronald Reagan holds the modern record. He raised the debt limit 18 times and once complained of "conservative Republicans who are playing games. ...We must have that bill or government checks will start bouncing." President George H. W. Bush raised it four times, Bill Clinton four times, the younger Bush seven times and Obama, so far, four times. More of Barbara Walters' exclusive first joint, post-election interview with President Obama and first lady Michelle Obama airs Friday, Dec. 14, on "20/20" at 10 p.m. ET on ABC stations. The latest summit to stop climate change, held in Doha, Qatar, over the past two weeks has been roundly slammed. Little was agreed to curb greenhouse gas emissions and the latest modelling, carried out by the Climate Action Tracker consortium shows global averages temperatures are still set to rise by at least 3 °C above pre-industrial levels. There was one breakthrough: developing countries won a promise from developed ones that they would compensate them for losses and damage caused by climate change. The deal offers the promise of large amounts of climate aid. But first, science will have to catch up with politics. All countries will suffer from climate change. There will be consequences even if humanity slashed its emissions and stopped temperatures rising more than 2 °C above pre-industrial levels, the stated goal of the UN negotiations. In actual fact, with emissions rising faster than ever, a 3 or 4 °C rise is likely this century. The consequences will be manifold. Deserts will spread and lethal heatwaves become more frequent. Changes in rainfall will bring droughts, floods and storms, while rising seas will swamp low-lying areas, obliterating valuable territory. Food production will fall. Before Doha kicked off, the charities ActionAid, CARE International and WWF released a report arguing that rich countries should compensate poor countries for such damages. Tackling the Limits to Adaptation points out that climate change will cost countries dearly, both economically and in less tangible ways such as the loss of indigenous cultures. So far, climate negotiations have taken a two-pronged approach to the problem. On the one hand, they have sought to create incentives or imperatives to cut emissions. On the other, they have established a pot of money for poor countries to pay for measures that will help them fend off the unavoidable consequences of climate change – such as sea walls and irrigation systems. That, according to some, leaves a third element missing. Helping those who suffer the consequences of climate change is a moral obligation and must be part of any treaty on climate change, says Niklas Höhne of renewable energy consultancy Ecofys. The idea of climate compensation has been around since the early 1990s, when the United Nations Framework Convention on Climate Change was negotiated. In Doha, a coalition including China, the Alliance of Small Island States and the G77 group of developing countries pushed for it to revived. They proposed a scheme that would decide when countries had suffered climate harms, and compensate them. It would be a form of insurance, and the greatest international aid scheme ever. The idea gained momentum after Typhoon Bopha struck the Philippines last week, and that country's negotiator Naderev "Yeb" Saño broke down in tears during a speech. And, although developed nations had little incentive to agree, the conference concluded with a promise to set something up next year. Compensation poses a fundamental challenge to climate science, which still struggles to work out if trends and events are caused by greenhouse gases or would have happened anyway. "We can't say that an individual event was caused by climate change," says Nigel Arnell of the University of Reading, UK. "What we can do is say that the chance of it happening was greater." Some climatologists are now running systematic tests to decide whether extreme weather events are caused by climate change. They run climate models with and without humanity's emissions. If the odds of a particular event are different, it suggests it was at least partially driven by emissions. By this measure, the 2003 European heatwave and 2011 Texas drought were both made more likely by human emissions. But this science is in its infancy. We can confidently attribute large-scale trends and temperature changes, says Kevin Trenberth of the National Center for Atmospheric Research in Boulder, Colorado. But changes in rainfall, and short-term events like hurricanes, are harder because we do not really understand them. Trenberth speculates that superstorm Sandy would not have flooded the New York subways without climate change, but says it's not possible to prove. Arnell says that might prove unworkable. Gradual changes – such as rising sea levels, melting glaciers and ocean acidification – are easy to attribute to climate change but their consequences difficult to cost; sudden events are easy to cost but difficult to attribute. There may be another possibility. Rather than examining individual events, climate models could predict the extra climate-related costs each country would experience, allowing regular payouts. "That would be a way round it," says Arnell. Delegates at next year's conference will have to consider these questions. Harjeet Singh of ActionAid in New Delhi, India, calls the Doha deal "a positive step forward". But it is only an agreement in principle: no money was committed, and even a promise to do so in the future was left out of the final text. Edward Davey, the UK's secretary of state for energy and climate change, said it was "far too early" to talk about committing money. "We aren't saying there should be compensation," he said. Singh says the developed world would save money by cutting emissions now, rather than letting temperatures rise and then paying compensation. Small island states were keen to get an agreement on loss and damage because emissions cuts are going so slowly, making dangerous climate change almost certain. The Doha agreement is a first step towards dealing with the consequences of that failure. Aside from agreeing to make compensation available for loss and damage, the Doha summit achieved little. Nearly two decades ago, the world's governments set out to agree a binding deal to cut greenhouse gas emissions. Doha included some baby steps towards a deal in 2015, but that is not guaranteed and in any case will come too late to stop dangerous climate change. Only Lebanon and the Dominican Republic made new emissions pledges. The talks were bogged down in rows over financing. In a deal that was separate to the adaptation fund, developed countries had promised in 2009 to deliver $100 billion a year by 2020 to help poor nations prepare for climate change. Between 2009 and 2012 they allocated $10 billion a year. In Doha they refused to say how they would scale that up, simply promising to "continue" – leaving developing countries unsure if or when they would get more. The Kyoto protocol was renewed until 2020, but its global effect is likely to be limited. Its value is partly symbolic, to show that binding agreements can be reached, and as one of many small and medium-scale projects to cut emissions.